Yamaha Motor Launches New Premium Printer YSP10, Enabling Full Automation of Production Changeover Work and Delivering World’s Fastest Level Cycle Time - News Releases | Yamaha Motor Co., Ltd. The YSP10 is the successor to the YSP, a high-end printer which featured 3S heads3 and stencil suction mechanism as standard equipment. The YSP10 has been newly designed and developed from the ground up in order to enable full automation of production changeover work, which occupies the most working hours in printing processes. In addition to existing automatic program changeover and Print Stability Control (PSC) systems, full automation of changeover work is achieved by including the new automatic push-up pin exchange, automatic stencil replacement, and automatic solder transfer functions (all of which are optional). In addition, the cycle time (including stencil cleaning) has been improved by 20% compared to previous models. Other enhancements include compatibility with a wider range of circuit board sizes and the new cleaner head achieving a significant reduction in cleaning paper consumption volume. The YSP10 will be exhibited at NEPCON JAPAN 2019, an electronics manufacturing and mounting technology trade show, to be held from January 16 to 18 at the Tokyo Big Sight (Koto-ku, Tokyo). 1: A machine which applies cream-based soldering product made of fine soldering particles, viscous fluid flux, and a binder to printed circuit boards with a spatula-like tool called a "squeegee." By heating in a reflow oven, the solder melts and bonds the surface-mount electronic components to the printed circuit boards. 2: Under optimum in-house testing conditions and based on Yamaha Motor data as of January 2019. 3: Swing Single Squeegee. Yamaha original printing head which controls the attack angle, speed, and printing application force with one squeegee. With the increase in the number of electronic components mounted in automobiles and the spread and diversification of smartphones, embedded electronic components are becoming ever-more compact, high density, diverse, and diverse in functionality. The increased adoption of ultra-compact components and narrow-pitch electrode components in response to these trends has driven significant increases in the difficulty of the process of solder paste printing onto printed circuit boards, and this process has become the most critical aspect determining the quality of the overall mounting process. At the same time, labor shortages have led to a rapid increase in demands to reduce the labor requirements of production sites. That is to say, the work involved in backup pin and stencil frame changeover not only occupies a large portion of the labor time in printing processes, but also - due to the increased difficulty of printing - requires a high level of skill. In response, the new premium printer YSP10 was developed to deliver high-accuracy and high-quality printing performance and accelerated cycle time as well as functionality to fully automate production changeover work. The reduction in labor requirements and cycle time also reduces the possibility of human error by reducing the need for skilled operators, contributing to improved productivity and quality. 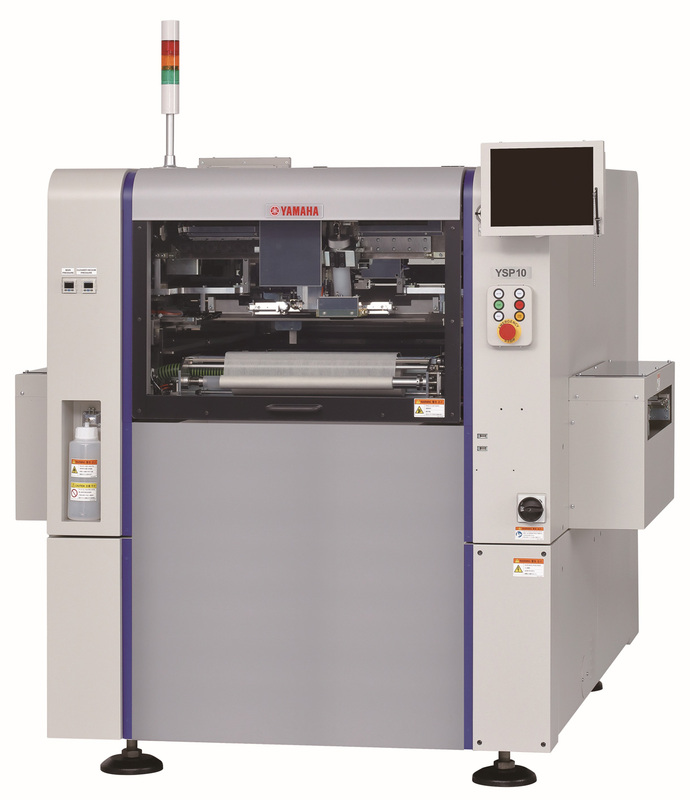 To date, Yamaha Motor has provided solutions which increase total line efficiency and quality by leveraging its strength as a full line-up manufacturer of production equipment including SMD storage systems, surface mounters, solder paste printers, dispensers, and testing systems. Yamaha will continue to enhance the interoperability of devices, and, through linkages with the Intelligent Factory IoT/M2M integration system, which enables centralized management to move from the standalone machine to the manufacturing line, overall factory, and even the whole-company level, will comprehensively increase the efficiency and quality of mounting processes. Push-up pins, which support circuit boards from below, are changed over automatically. The pins are free-location models which use magnets, and suit the shape, pattern, and lower surface mounting state of the printed circuit boards, enabling positioning at the optimal location of the user’s discretion. In addition, the dual suction heads enable simultaneous suction and placement of pins, reducing changeover time. The stencil to be used in the next production batch is preset while the printer is operating, and the production changeover work is carried out automatically. The space-saving design provides for both the setting and collection of new and used stencil at the rear of the machine. The operator can conduct setup in advance when they are free, without stopping the printer, therefore enabling reduction in the time required for replacement. The squeegee head has also been fitted with a new solder catch plate, preventing solder from dropping onto the stencil during replacement. In addition, the one-touch stencil frame size switching mechanism enables simple changing to a range of stencil frame sizes without using tools. During stencil replacement, solder remaining on used stencil is automatically scoop up without waste, and is promptly transferred onto the new stencil after replacement. This not only reduces the amount of solder disposed of, but - thanks to re-using the solder from before stencil replacement - solder rolling work before starting the next model is no longer necessary. Through use together with the automatic stencil replacement function, time lost and human error in production changeover switching are significantly reduced. Reduction of the circuit board conveyance time through revision of the drive system etc. and motion sequence optimization has achieved a cycle time including stencil cleaning of 12 seconds, the world’s fastest level (under Yamaha Motor's optimum conditions; 10 seconds in regular printing). This 20% speed increase compared to previous models delivers higher productivity. The range of compatible circuit board sizes has been expanded from the previous L510 x W460mm to L510 x W510mm. Compatibility with large concentrated circuit boards (which bring together multiple circuit boards into one), lighting circuit boards for large LCD panels, or large industrial boards etc. has been expanded. In addition, compatibility with extra-large circuit boards of L610 x W510mm is available as an option.